So, it’s finally here, and practically jumped into the HS.com PS4! The oh-so super-powered sequel to the mega fighting game Injustice: Gods Among Us, Injustice 2 features a massive roster of DC Super Heroes and villains (the usual Harley Quinn, Green Lantern, Batman and an uber-cool lookin’ Joker alongside loads more). This time around players can build and power up the ultimate personalised version of their favourite DC characters, which is a definite highlight. Now, we can take control of how the characters look, fight and develop across a variety of game modes. It certainly breeds more excitement than usual in a game that feels quite familiar in terms of playability and storyline. On that note, Injustice 2 really does continue on with that epic cinematic story vibe introduced in Injustice: Gods Among Us. 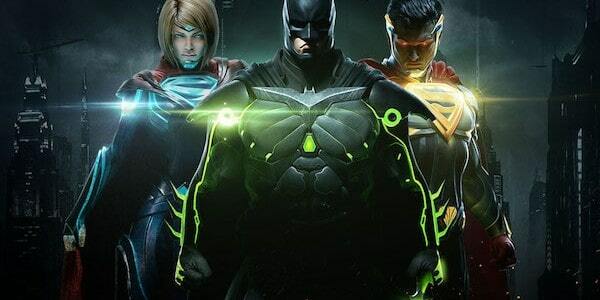 Without giving away too many spoilers here – the basic idea is that good ol’ Batman and his allies work towards pulling society back together while struggling against those who want to restore Superman’s dark regime (read up on the first game if you don’t get it…), oh, and there’s an invasion from Braniac in there too. We’re unsure whether the aforementioned Joker is actually alive (he totally died in the last one…), but he is a playable character! The story has some fantastic unique arcs for different characters that can be played through, so it’s worth playing through with all of your faves just to see what happens to ’em. Anyone who got into its predecessor will be right at home with Injustice 2. Fighting involves putting together a combination of attacks that allow you to build your power meter. Every bar added to said meter means that you can use a specific kind of attack, such as interrupting an enemy’s super move, or pulling off your own power moves for a big win. These include using a truck to wall-run across a part of a level, or even an electric chair to cook your opponents in…nasty. Also, if you land a powerful enough attack, it unlocks another part of the stage to destroy, which is a nice touch. All in all, Injustice 2 seems to be more than a little similar to the first, only much prettier to play, and a little more flashy in terms of the overall combat system, and that’s no bad thing. If it ain’t broke, as they say. Indeed, the epic story mode is where this stands out the most, ad as fellow gamer geeks, we know that you’ll appreciate that. Just incase you were wondering, yes, it is better to spend your time playing this than watching Batman v Superman, or Suicide Squad ever again.